Meg Clixby grew up in Maine and then quitted to Western Mass for eight years. She took a hiatus during that time to live in Brighton, UK where she began to play bass guitar and participated in The Polly Shang Kuan Band. This collaboration continued once back stateside for a NE US mini-tour after which Meg began to play with her WMass brethren in projects such as Duck and Bottoms Up. After moving to Brooklyn, she continued to play with friends indoors but now lives in the woods and jams with herself. Bass, pedals, tape. 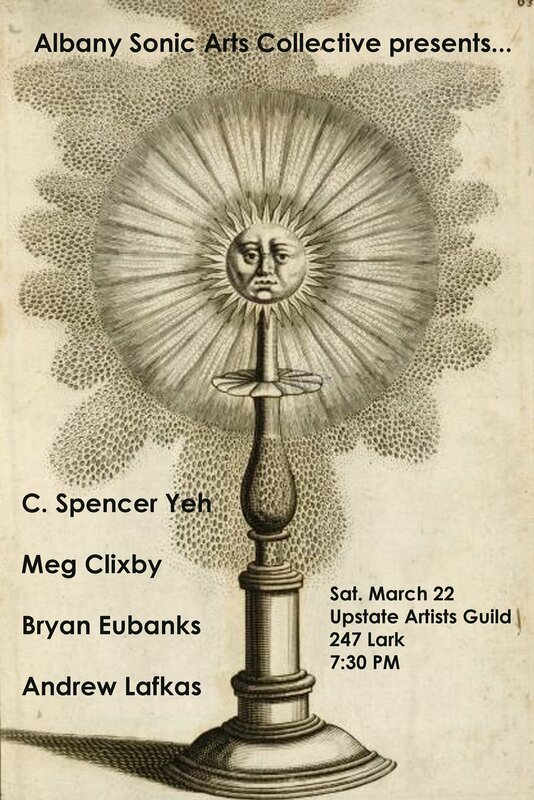 This entry was posted in Music and tagged Albany, Albany Sonic Arts Collective, Andrew Lafkas, Austin, Bryan Eubanks, C. Spencer Yeh, Electronics, Improvisation, Meg Clixby, Music, No Idea Festival, Saxophone, Upstate Artists Guild, Violin by Holland Hopson. Bookmark the permalink.